Anyone who remembers Ladybird Books from the 1970s and 1980s, or those wanting to discover them for the first time, are urged not to miss this exhibition. H is for House: Living in a Ladybird Home transports visitors back into the world that will be familiar to millions of people who grew up with Ladybird Books. The iconic books perfectly captured everyday objects and fashions in the exquisite illustrations which remain hugely popular today, providing a social snapshot into specific periods of our recent history. 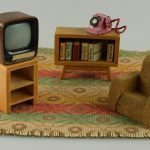 Visitors will be able to see original Ladybird Books, as well as familiar household items of the 1970s and 80s from the Leicestershire Museums Collection, including a trim phone, Hoover vacuum cleaner and a Teasmade. There will also be the opportunity to recover lost dialling skills on a rotary telephone, have a go at drawing the objects on display to create Ladybird-style illustrations or play in the child-sized kitchen styled the museum’s 1970s dolls house. The exhibition is sure to appeal to anyone who remembers playing with the same toys as Peter and Jane, wearing the same clothes or ringing their friends on a similar telephone.